Giving back to the community--and revitalizing Elizabethtown--is a part of the heart of the Swope Family. That has been true since 1953, when the Swope Automotive Group was created, but was revitalized a few years ago when Carl Swope realized the power that he and his employees had to improve their Central Kentucky community. The Swope Family’s campaign of community engagement began in earnest with two initiatives: the creation of Elizabethtown Renaissance Associates, with the goal of reawakening downtown Elizabethtown, and an in-house Swope Family of Dealerships process, which allows employees to suggest ways to give back and get the support of the Swope Family to accomplish those goals. You’ll see some of the results of both of these initiatives below. We are so proud that Carl Swope’s legacy of leadership in the community was recognized in 2017, when he was named the Time Dealer of the Year. We are equally proud of every one of our employees, who are the hands and feet that make our community service possible. Our employee efforts are spearheaded by Susan Gifford, the Swope Director of Marketing and Quality Initiatives, who has been honored for her own community efforts. As the liaison between the Swope Family of Dealerships and the community, Susan sits on multiple charitable and NGO boards and brings the suggestions of employees to the leadership team each week. The Swope family of dealerships is committed to our community and the people who make it the fantastic place to live that it is. Our community outreach extends throughout our organization, including everything from matched employee donations to holiday toy drives to soup kitchen partnerships. The Swope family and its associates love our community and want to make it better, and we believe that starts with us. The mission of Habitat for Humanity in Hardin County is to eliminate poverty one home at a time, and that mission is one that the Swope family is proud to support. Habitat enlists community partnerships with everything from the funding for materials to the construction of homes, allowing low-income families the pride of owning their own home with a 25-year, zero percent mortgage. We’ve been proud to be able to support this effort with vehicles and fundraising support, and look forward to continuing to support Habitat’s vision for the future of Hardin County. The Swope Family of Dealerships has been proud to partner with Toyota to benefit Feeding America: Kentucky’s Heartland, the local division of a national organization that helps people in poverty get enough to eat. Feeding America: Kentucky’s Heartland serves 42 counties were 1 in 6 adults and 1 in 4 children are hungry. With more than 200 partner agencies, Feeding America serves 16,700 people each week—and Swope is proud to support that grassroots effort. In 2014, we were proud to be a part of Toyota’s 100 Cars for Good program and donated a Toyota Highlander to the organization, and we continued that effort with fundraisers and corporate donations since. Our Swope Certified crew spent a very cold afternoon serving food to those who need it most, setting up outside the Lord’s Supper Mobile Ministry RV. The Lord’s Supper Mobile Ministry travels to where they are needed, and when they were asked if they wanted to participate in this cause, every single Certified associate said yes! In fact, the Certified team now pairs up with Lord’s Supper several times a year because it is their favorite community activity. While we love partnering with large local agencies, at Swope we also love the idea of making a difference at every level. We often get involved in community projects like test drive events at local elementary schools, which gives a flat rate to the school for every test drive completed, and the Polar Plunge, which raises money for children’s literacy in our community. Our dealerships regularly hold food and toy drives. The Swope dealerships have proudly supported the United Way of Central Kentucky for more than 17 years, encouraging and matching employee contributions, becoming one of its community impact leaders, and participating in many of its community outreach projects. One such project involved Spring Haven, a local organization that focuses on helping abused family find a new and healthy start. We are privileged to partner with a community organization that works here in Central Kentucky to make a real difference in the lives of our friends and neighbors. The UWCK contributes to major organizations like the American Red Cross, Big Brothers Big Sisters, and Feeding America at the local level. For the American Red Cross, our associates refurbished the Disaster Relief office, including paint, flooring, window treatments, and furniture. We have several owners and associates who serve as Big Brothers and Big Sisters, as well as an associate who volunteers time to sit on the board of that organization. We’re proud to sponsor the Big Brothers and Big Sisters annual fundraiser, Bowl for Kids Sake. 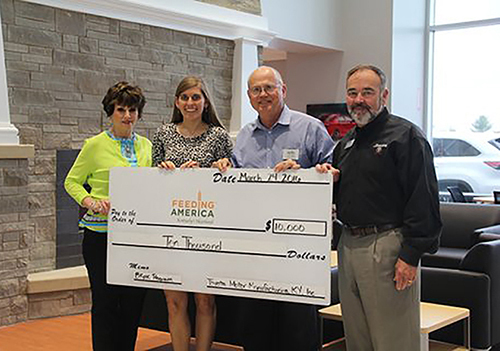 With Feeding America, we have led canned food drive initiatives and we volunteer at their packaging facility a few times a year to help with their backpack and senior programs. The backpack program offers food bags to kids on Friday afternoon, to make sure that they are fed when they’re not at school, and the senior program supplements the great work of the Meals on Wheels program in our county. Another local partner we have been proud to work with for the last few years is Helping Hands of Hope, an organization that works with people in Hardin County who may need assistance to both alleviate their circumstances and help them identify ways to improve their overall situation. Helping Hands of Hope offers temporary help with rent, utility, clothing, prescription medication, furniture and appliances, and transportation for medical appointments as well as job readiness and budgeting classes. Swope has been proud to support the work of this community partner, which helps to reach individuals who are in the most need. The Swope Family has been proud to support the vision of Rachel Ritchie, who wanted to create an accessible playground for her friends and neighbors. We have partnered with Rachel multiple times to raise money for her incredible goal, donating money and sponsoring fundraisers including a festival and a golf scramble. We are so proud of Rachel’s determination and especially of the playground that will benefit the community for years to come. Her spirit of community involvement and charity is exactly what we at Swope want to encourage and cultivate! We are a proud sponsor of the Ken-Ducky Derby, an annual festival held close to Derby time that benefits Harbor House of Louisville. The festival raises money for Harbor House programs, which benefit hundreds of people with disabilities and their families. These programs include things like cooking classes, job training, education, arts and humanities activities, and community outings among others. We are proud to have offered the first prize to the 2017 winner, a Ford F-150, and to have the Swope name associated with such a tremendously worth cause in our community. 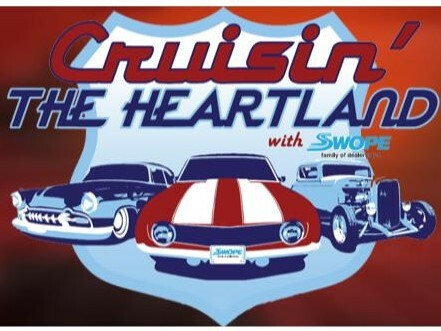 Swope Auto Group was proud to continue our partnership with The City of Elizabethtown and Elizabethtown Tourism to sponsor the 8th annual Cruisin’ the Heartland during the weekend of July 28 and 29th, 2017. This fun-filled weekend with a focus on yesteryear brings car lovers and car collectors from all over the country and has been named one of the top cruise-ins in Kentucky and in the nation by several publications. Families and visitors alike enjoyed concerts, car cruises, car shows, and even a pedal car parade for kids. This year, Swope was proud to also offer the winner of the Marilyn Monroe contest, Savanaha Campbell McGrew, a retro photo shoot with an incredible 1939 Rolls Royce from the Swope Cars of Yesteryear Museum.